Climbing hydrangea vines are large plants, sometimes reaching 50 feet tall or more at maturity, in early summer, they produce fragrant, lacy, flat topped white flower heads. These lace caps can be 5 inches or more in width and are composed of showy flowers on the outside and less showy on the inside. When dried out, the flower heads turn reddish brown. Some gardeners cut off the dried flower heads for use in crafts. The leaves are medium green during the summer and turn yellowish in autumn. But these plants are not grown for their foliage color. The plants’ peeling bark provides some winter interest. Plant Purple Wisteria in your backyard and you’ll smell it from the front of the house. Its fragrance is like lavender gardenia blend. You can clip off a few flower clusters and put them around your home. Its’s like a natural air freshener. This is a very forgiving plant. It grows in a wide range of soils even sand and clay. Tolerates drought and salt. Purple Wisteria flowers best in full sun but can grow in partial shade in the south. It’s ideal to plant near entryways and patios… and anywhere you entertain guests. Boston Ivy, unlike most vines, waits until fall to put on a show when its foliage turns a bold, rich red. It’s a fast-growing vine that uses small adhesive disks to attach to the side of a wall, fence, or other structure. The vine also features purple fruits that attract birds, though these fruits are quite poisonous to people and pets. If your looking for a tough tropical vine with lots of color, you’ve found it. Bougainvillea plants are tough as nails, which includes their nail-like thorns. These plants put on a spectacular show of color in spring on their fresh new growth. If planting bougainvillea be sure to allow plenty of room for it to spread and grow. Clematis is one of the showiest vines, with many types of shapes and colors. These plants look wonderful climbing any kind of structure. Bloom-time ranges from late spring to fall depending on the type and variety. 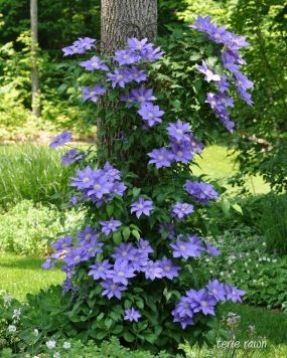 With proper planning, It’s possible to have clematis blooms throughout the growing season. Hummingbirds and butterflies adore honeysuckle. The fruit provides a fall treat for songbirds as well. Honeysuckles are heat tolerant and wildly attractive in any garden. These are only a few of the rambling vines that can add a new dimension to your garden. Let us know if you would like a rambling vine addition to your garden.